Paul Lambert had no complaints over Charlie Adam's costly 30th-minute dismissal as Stoke's relegation fears grew with a home loss to Everton. Adam was one of the veterans Lambert called upon for this crucial clash with a Toffees side that had lost five successive top-flight away games, but the 32-year-old turned the contest in Everton's favour when he lunged in with a studs-up challenge on Wayne Rooney that prompted referee Martin Atkinson to show the red card. 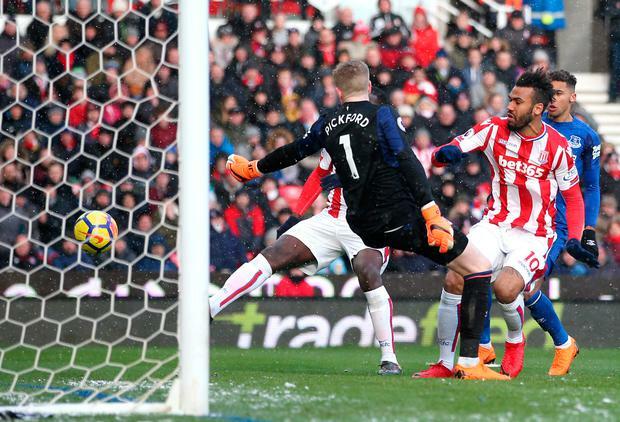 Cenk Tosun then scored a brace for the visitors, the second an 84th-minute winner after Stoke substitute Eric Maxim Choupo-Moting had cancelled out his opener, to leave Lambert's side three points adrift of safety. Visibility was poor in the swirling snow, yet upon seeing a replay of Adam leaping into a challenge with his feet off the floor, Lambert had no gripes. "I couldn't really see it with the weather at the beginning, but I saw it on the monitor and I can understand why Martin's given the red card," the Potters boss said. Lambert's opposite number, Sam Allardyce, said: "I haven't really seen it again, but it looked pretty dangerous the way he's slid in." Lambert correctly felt injustice over Tosun's first goal as the assistant referee's flag stayed down despite the striker being offside when he initially met Yannick Bolasie's cross before putting away the second rebound. However, he could only lament his side's defending for Tosun's second as Stoke allowed the Turkey international to meet Theo Walcott's cross for his fourth goal in three games.